Post subject: Anyone near Lichfield? 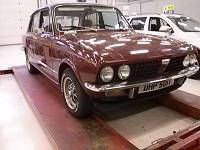 Big ask but is there anyone near Lichfield, who can view a Dolomite for me that is up for sale? Its on ebay and looks in pretty good nick. I have been looking for a while now for a decent car but I am in London and I haven't any opportunity to get there this week. If anyone is able to take a look for me this week, by arrangement with the owner, please let me know and i will make the necessary arrangements to suit. Post subject: Re: Anyone near Lichfield? I'm not too far from Lichfield so probably could have gone, but as nice as it is, there is no way that car was built in 1976! What makes you say that Alun? Everything about it is a late model! I'd say '78 at the earliest. Would 76 have the large No plate lamp then? Change over year for that, but in all probability, one on a P plate would. The real giveaway is the tandem master cylinder; of course, it may have been changed...along with everything else!